We are Bill and Nancy Oakes. 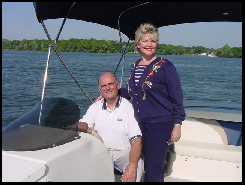 We live and work on beautiful Old Hickory Lake in Hendersonville, TN and love selling waterfront homes throughout Middle Tennessee. Should you wish to perform your own personal search we have a unique MLS Property Search Engine that allows you to narrow your residential search to just Waterfront properties. To search for any of over 450 lake homes currently for sale, click SEARCH MLS above, Advanced Search, then select “On a Waterfront”. When you find any property of interest, just phone or e-mail us and we will provide additional information, photos, virtual tours, etc. and show the property to you by land or water.Upon request, we will also be delighted to set up a custom search for you that will automatically notify you daily of all new listings meeting your search criteria. We look forward to serving you as your “Buyers Agent” at no cost to you to purchase any lake home. In fact, if you will avail yourselves of our services, we will provide you free of charge with an AHS one year home warranty, a $459.00 value, on any home purchased through us. If you are a seller, we will also provide the warranty free to you which will cover you during the listing period and your buyer for a year thereafter – a Win-Win situation.